Honor added to trophy case packed with Player of the Year awards from multiple media outlets, AP, Gatorade, and Naismith. Michael Porter Jr. remains undefeated. The Nathan Hale star was named MVP of the 40th annual McDonald’s All-American game Wednesday after leading the West to a 109-107 win against the East at the United Center in Chicago. Porter, a 6-foot-9 forward, finished with 17 points and eight rebounds. He also had a game-saving deflection in the waning seconds to keep the East stars from tying the score to force overtime. The win is part of a wild week tucked into an even more bizarre year for Porter. He asked for and received a release from the University of Washington for his national letter of intent on March 22. He then verbally committed to Missouri on Friday after his father accepted an assistant men’s basketball coaching position at the school on Thursday. The family relocated to Seattle from Columbia, Mo. last summer when his father was hired by UW men’s basketball coach Lorenzo Romar. 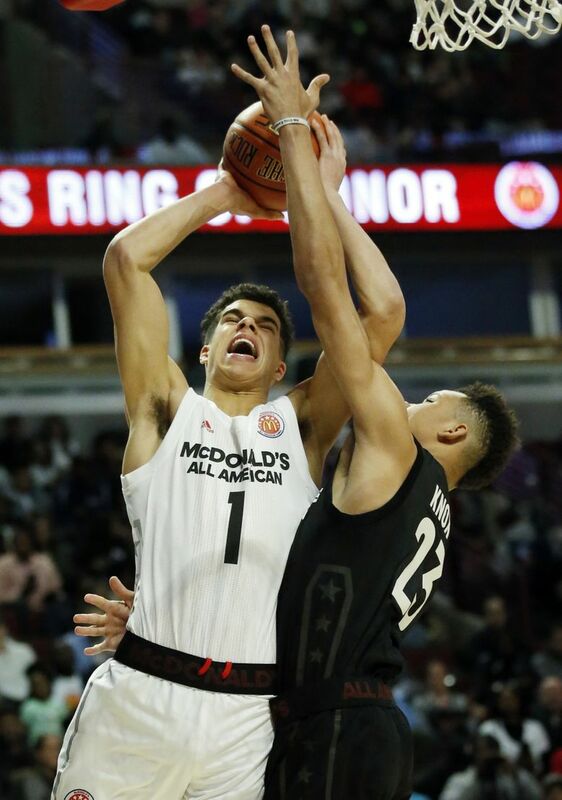 The younger Porter kept Seattle listed as his hometown in graphics for the McDonald’s All-American game despite referring to Columbia as his home once decommitted from Washington. ESPN commentator Jay Williams applauded the Porters’ decisions, which were prompted by the firing of Romar. The latter is Porter Jr.’s godfather. “I love that we’re in the age of players taking the power back,” said Williams during the game’s broadcast. Wednesday’s victory closes a month that began with Porter leading Nathan Hale to its first boys basketball state championship to cap a 29-0 season. He received the Class 3A tournament MVP honor, too, scoring 27 points with 17 boards. Porter averaged 36.2 points, 13.6 rebounds, 5.0 assists and 2.4 blocks per game for the Raiders, defeating teams on both coasts and those in the competitive Metro League. He’ll next play in the Nike Hoop Summit on April 7 in Portland and the Jordan Brand Classic on April 14 in Brooklyn.